The voice-activated speaker is capable of providing basic information, thermostat control and the exposure to natural daylight (Courtesy IHG & Baidu). The management of hotels, from general room keeping to office administration, requires scores of employees coordinated around the clock to service guests needs. 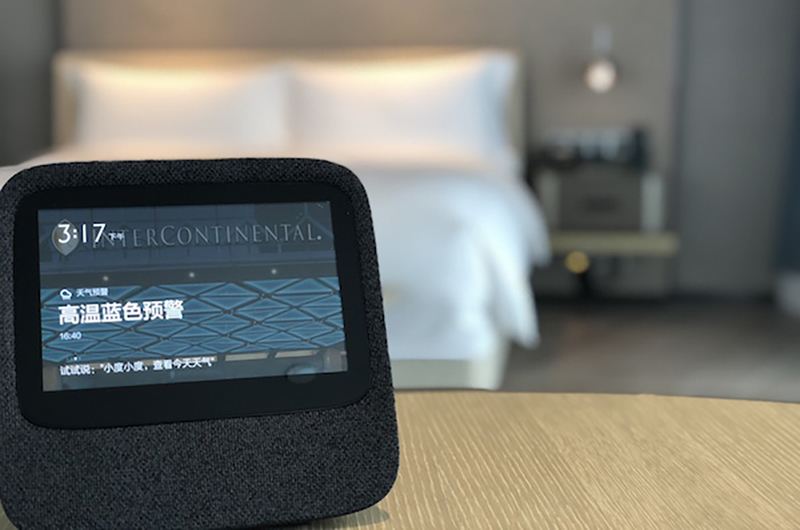 Multinational-hospitality company Intercontinental Hotels Group is experimenting with artificial intelligence to streamline customer service across its hotels. In July, the company rolled out the AI hotel rooms for its Sanlitun, Beijing location, but plans to implement the technology in 100 suites across China. The project is an ongoing collaboration with Baidu, a Chinese internet services and artificial intelligence company. According to the Global Times, the suites are outfitted with a voice-activated AI speaker which uses Baidu’s DuerOS Platform. Guests are able to ask the AI platform basic questions, such as travel times to nearby destinations and room service options within the hotel. Additionally, the DuerOS Platform is capable of adjusting the room’s thermostat, lighting and the drawing of curtains. Currently, Baidu is researching the feasibility of using the DuerOS Platform to collect data on the user preferences of the room occupants. In archiving a guest’s habits and service preferences, the AI system could be capable of suggesting rooms based on lighting and temperature preferences, as well as recommend food service items.